Instagram is so inherently a mobile-first experience, I didn't think it would be made any better by a desktop client. And yet Pixsta, a PC desktop Instagram client for the Pokki platform, feels like a Daft Punk song: Better, faster, stronger. Formerly known as Instagrille, the newly-christened Pixsta cheerfully eschews traditional Windows chrome, opting for a gray look with drop-shadows that would look right at home on a Mac. Despite not feeling like a native Windows app at all, it works: The lack of window borders puts the images front and center. You can resize the window to fit more images in, and toggle between a linear and a tile-based layout. 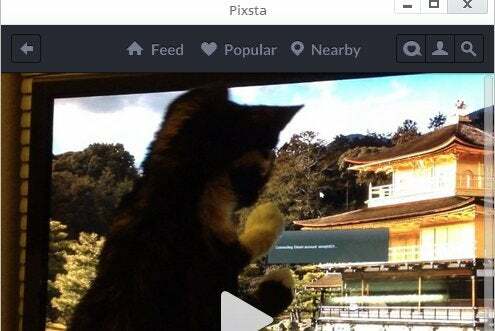 With a wider window, Pixsta fits more information on the screen. Resizing the window changes the layout responsively. With a narrow window, the list view shows an image followed by its comments; make the window wider, and the comment thread pops up to the side of the photo. Make it wider still, and you can fit multiple images and comment threads side by side. Once you log in with your Instagram account, you can Like photos and participate in discussion threads (being able to type on a full-sized keyboard makes commenting better, too). The only feature missing is a way to quickly flick through photos, one at a time: You can quickly scroll, but it's difficult to scroll exactly one photo up or down in the stream. Instagram videos work well in Pixsta. You can play them just like on your phone, but you can also download them for safe keeping. By default, the video I downloaded was saved with no filename extension, but manually tacking on ".mp4" at the end worked. VLC played the video without a hitch, sound included. When it comes to speed and responsiveness, Pixsta just flies. Photos load instantly, and the interface is quick and responsive. I tested the app on a powerful desktop machine, and the fast processor and 21-inch monitor made everything that's good about Instagram, better. Of course, your connection must be fast enough, too: On mine, videos did occasionally stutter. 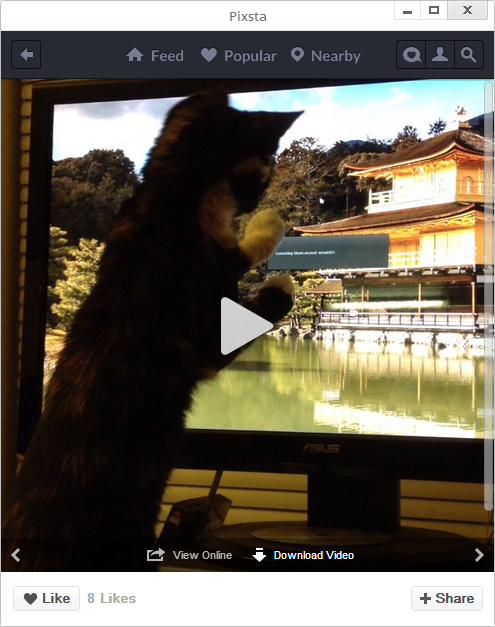 Cat videos have never looked better. Pixsta is free to download and use. 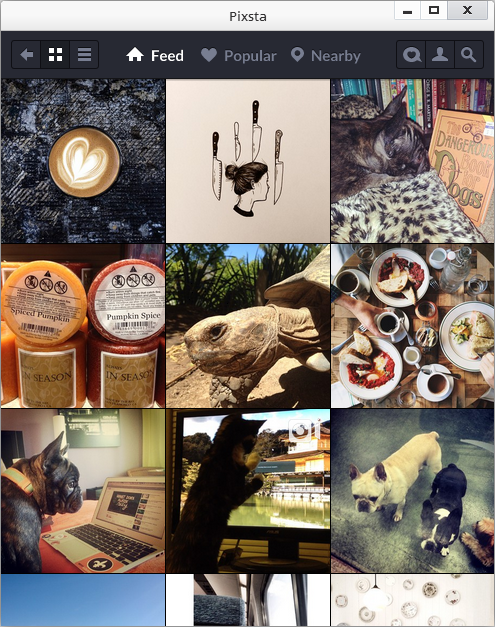 Even if you only follow a handful of friends of Instagram, it's a dramatically better way to experience the service. Get it now, and your friends' cat videos will never look the same again. 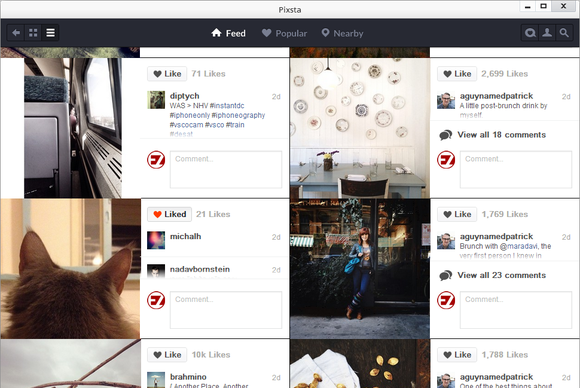 Pixsta (formerly Instagrille) is an excellent way to enjoy Instagram on your desktop.